This week, SoxProspects.com wraps up its season-end countdown of the top 40 prospects in the system, recapping their seasons and previewing what's ahead in 2014. You can find all of the entries in this year's series here. Pre-2013: After an ACL injury during his senior year in high school weakened his draft stock, the Red Sox scooped up Cecchini in the fourth round of the 2010 draft, signing him away from a commitment to LSU with a $1.31 million signing bonus. 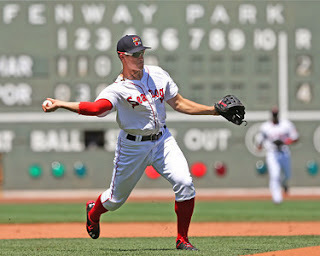 He made his professional debut in 2011 with the Lowell Spinners, making the transition from shortstop to third base. He struggled a bit in his first taste of pro ball, beginning his year in a 5 for 32 rut and hitting .215 as late as 21 games into his season. However, he still showed an ability to draw walks and drive the ball when he made contact, with a .311 on-base percentage and .392 slugging mark at that point, and the breakout those numbers portended came to be, as he hit safely in nine of his final 11 games that season for a .486/.581/.743 line. Unfortunately, a wrist fracture on July 23 ended his season just as he was getting hot. In all, he posted a .298/.398/.500 line with three home runs, 12 doubles, and 12 stolen bases in 32 games, showing his inexperience at the hot corner with 10 errors, while also transitioning from shortstop to third base. After earning his first full-season assignment with Greenville in 2012, Cecchini continued to make strides. He started slow, but around the middle of April he adjusted, getting on base in 30 straight games from April 13 to May 19. He was one of the system’s most consistent performers, going more than one game without a hit just three times after that point, finishing the year with an impressive .305/.394/.433 line and, perhaps most importantly, staying healthy for the whole season. Stunningly, he stole an impressive 52 bases in 118 games played, 16 more than anyone else in the system, despite a lack of elite speed. He also showed drastic improvement at third base and was named a South Atlantic League All-Star in 2012. His second-half performance (.326/.425/.456) hinted at a player whose prospect status was on the rise. 2013 Season in Review: Cecchini started off the 2013 season with a bang in High A Salem, and even following a promotion to Double-A Portland in mid-June, the third baseman’s bat hardly cooled off all summer. A .392/.478/.709 line in April led to both a SoxProspects.com Player of the Month Award and recognition as Boston’s Minor League Offensive Player of the Month. Cecchini would remain hot throughout May and June, with his play earning him a spot in the Carolina League All-Star Game and ultimately a promotion to Double-A on June 21. In 63 games played for Salem in 2013, Cecchini batted .350/.469/.547 with 28 extra-base hits and more walks (43) than strikeouts (34). At midseason, he was considered perhaps the hottest hitter in the minors. Following his promotion to Portland, Cecchini continued his success at the plate, posting an .850 OPS in July and receiving an invitation to play in the Futures Game, where he smacked an RBI double in his lone at-bat. Despite a small dip with the bat in August (.260/.406/.337), Cecchini maintained a patient, successful approach on offense and finished with a .420 OBP in 240 at-bats with Portland. All in all, Cecchini’s 2013 season was a huge success, as the 22-year-old set career highs in batting average (.322), home runs (seven), extra-base hits (47), and walks (94), and led the minor leagues in on-base percentage among qualified hitters. Cecchini also finished the season with the highest marks of any Red Sox minor leaguer in batting average and OBP. After the season, the Red Sox sent Cecchini to the Arizona Fall League, where he has hit .250/.391/.308 with three doubles in 14 games and was named to the league’s Fall Stars Game where he hit a 430-foot home run in the eighth inning. Photo credit: Garin Cecchini by Kelly O'Connor.